We propose the concept of spatial analytic interfaces (SAIs) as a tool for performing in-situ, everyday analytic tasks. Mobile computing is now ubiquitous and provides access to information at nearly any time or place. However, current mobile interfaces do not easily enable the type of sophisticated analytic tasks that are now well-supported by desktop computers. Conversely, desktop computers, with large available screen space to view multiple data visualizations, are not always available at the ideal time and place for a particular task. Spatial user interfaces, leveraging state-of-the-art miniature and wearable technologies, can potentially provide intuitive computer interfaces to deal with the complexity needed to support everyday analytic tasks. These interfaces can be implemented with versatile form factors that provide mobility for doing such taskwork in-situ, that is, at the ideal time and place. We explore the design of spatial analytic interfaces for in-situ analytic tasks, that leverage the benefits of an upcoming generation of light-weight, see-through, head-worn displays. We propose how such a platform can meet the five primary design requirements for personal visual analytics: mobility, integration, interpretation, multiple views and interactivity. We begin with a design framework for spatial analytic interfaces based on a survey of existing designs of spatial user interfaces. We then explore how to best meet these requirements through a series of design concepts, user studies and prototype implementations. Our result is a holistic exploration of the spatial analytic concept on a head-worn display platform. 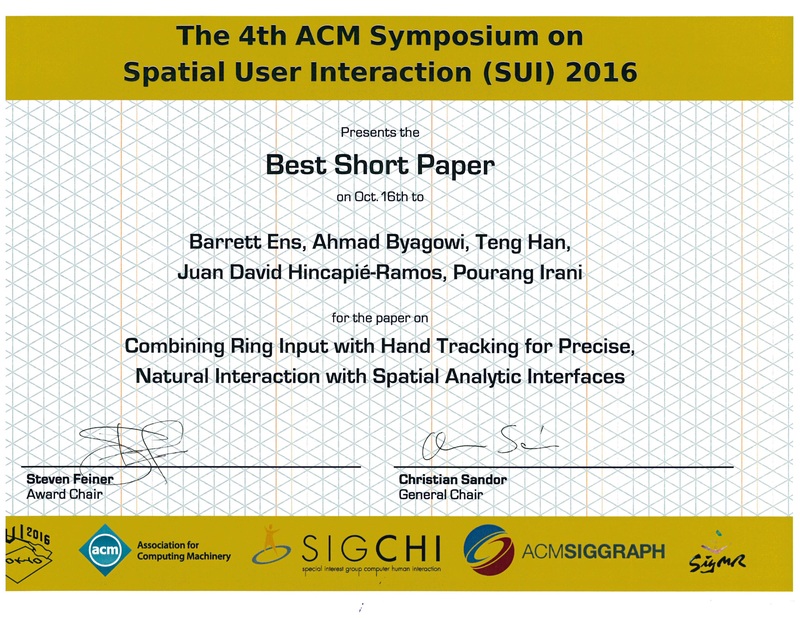 The final publication from this project was awarded Best Short Paper at SUI 2016 in Tokyo, Japan.